Set up a test PCR to determine the optimum # of cycles. You want to identify the minimum number of cycles required for a visible product at 166 bp. I chose 4 of the samples and tested them at 12, 17, 22, & 27 cycles as recommend in the protocol. Added 12 uL master mix to 8 uL ligation. 17 and 18 are 2 of the ligation reactions for comparison. 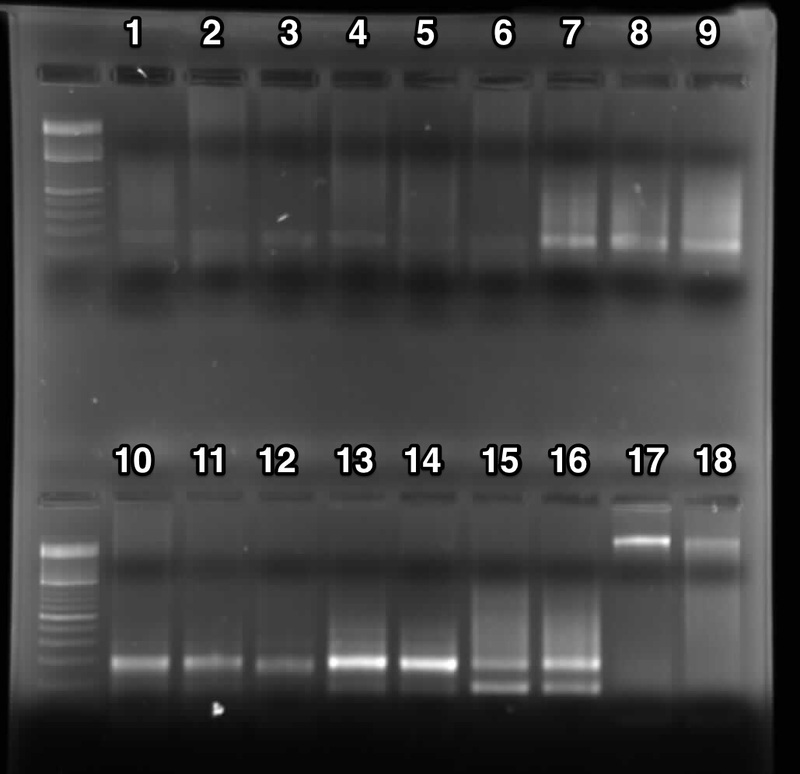 Programed PCR in thermocyclers 4,5,6. Called 2b12, 2b17, 2b22, and 2b27. It looks like 22 cycles is best, and worked on all samples so will be using that in the preparatory scale. Left in ethanol and sodium acetate in -20C overnight. This entry was posted in Lab Notebook, Puget Sound Oly Common Garden and tagged 2b-rad, Fall 2015, gel, PCR by ksil91. Bookmark the permalink.